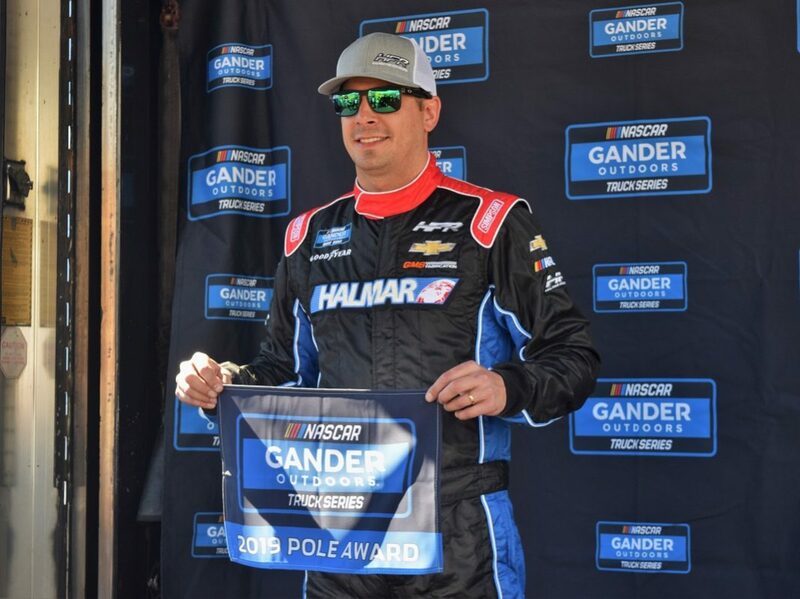 MARTINSVILLE, Va. – Stewart Friesen edged all-time NASCAR Gander Outdoors Truck Series wins leader Kyle Busch on Saturday morning to capture the pole for the TruNorth Global 250 at Martinsville Speedway. Friesen came to the sharp end of the order when it counted, turning a lap of 19.630 seconds (96.465 mph) with his No. 52 Halmar International Chevrolet Silverado during the final round of qualifying. The pole is the third of Friesen’s Truck Series career and his first at the half-mile Virginia paper clip. “That was good. The guys did a great job,” noted Friesen following his pole-winning run. “Thanks to everyone at Halmar and all the guys at the GMS (Racing) fabrication shop for working so hard on this stuff for us. Our Chevrolet Silverado was fast. We made a couple small air pressure adjustments and a little bit of trackbar in the last round, and Trip (Bruce, crew chief) nailed it. Busch will join Friesen on the front row after a lap of 19.650 seconds (96.366 mph) in the final round with his No. 51 Cessna Toyota Tundra. 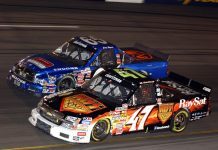 Busch is undefeated in two Truck Series starts so far this season. 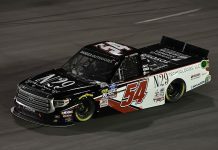 Todd Gilliland and Sheldon Creed will share the second row of the starting grid, with defending Truck Series champion Brett Moffitt starting fifth in his pursuit of a Martinsville grandfather clock. 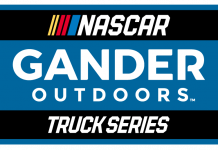 Matt Crafton, the debuting Raphael Lessard, four-time Martinsville winner Johnny Sauter, Austin Hill, Ross Chastain, Derek Kraus and Austin Dillon filled out the first six rows and all advanced through each of the three knockout rounds on Saturday. Bubba Wallace was the first driver who failed to advance into the final round of qualifying and will start 13th for AM Racing after a lap of 19.799 seconds (95.641 mph) with the No. 22 Chevrolet. Other notables starting deep in Saturday’s field include Tyler Ankrum (14th), Myatt Snider (15th), Harrison Burton (18th), Grant Enfinger (19th) and David Gilliland (21st). With 38 trucks on the property, the six drivers who failed to qualify for the starting field were Codie Rohrbaugh, Dawson Cram, Juan Manuel Gonzalez, Ray Ciccarelli, Norm Benning and Tony Mrakovich. To view the complete starting lineup, advance to the next page. Jacob Seelman is a 26-year-old writer who studied Broadcast Journalism at Winthrop University in Rock Hill, S.C. He also serves as the tour announcer for the Must See Racing Sprint Car Series.